With the date for the EU Referendum now announced for 23rd June, here is Matthew Goodwin’s latest “A round-up of research on Britain’s EU Referendum”. He also discusses how important Boris Johnson’s ‘Out’ position might be! Well, it might be crunch time but there is also considerable confusion in the polls. Let’s take a step back and look at what is actually going on below the surface. Game on! Britain’s referendum on its continuing EU membership is scheduled for June 23rd. So how are the Remain and Leave camps doing – what is the state of the race so far? Well, it might be crunch time but there is also considerable confusion in the polls. Let’s take a step back and look at what is actually going on below the surface. As I wrote for The Times Red Box this week the picture is far from clear and so. The headline, take home point is that the polls conducted online tell a very different story about what is likely to happen to the polls conducted via telephone. For this bulletin, I ran the numbers on all polls conducted since the start of December 2015. Look at the chart below (if you cannot see it click on ‘view this e-mail in your browser’ above). 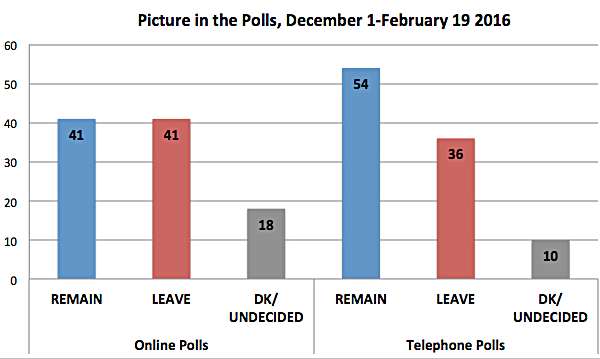 In online polls, by companies like ICM or YouGov, the referendum race looks very close. It is a dead heat. Remain is on 41%, Leave is on 41% and undecided voters represent a not insignificant 18%. If you look only at these numbers then you would conclude that there is everything to play for. But now look at the average result from polls conducted over the telephone. In these polls, conducted by firms like Ipsos-MORI and ComRes, it is a very different story. Remain, on 56%, holds a striking 18 point lead. It looks set for a comfortable victory (this was also true in a new and post-EU deal Survation telephone poll that was released last night that put Remain on 48%, Leave on 33% and Undecided on 19%). It is not even close. In the telephone polls there are also a much smaller number of undecided voters, a point I will come back to. This is not just a nerdy point. It really matters. The polls will strongly influence the referendum – the campaign, voters and journalists. 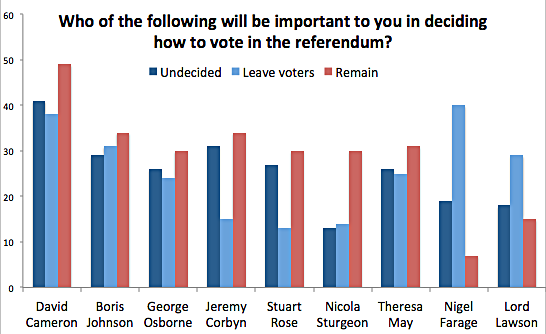 Just look back to that YouGov poll a few weeks ago that gave Leave a 9-point lead. Brexit loomed. Cameron was toast. But only a few days later along came a telephone poll that gave Remain a 8-point lead, then another that gave Remain an 18-point lead, and then the one last night that put Remain 15 points ahead. There are different theories. One possibility is that the polls are being influenced by something called ‘social desirability bias’ – which leads some voters to give pollsters an answer that they think is socially desirable (even if this is not their actual view!) People might not have a problem admitting their desire for Brexit to a computer online but they might be more hesitant when there is another person on the end of the telephone. This might be contributing to the strong lead for Remain in the telephone polls and the fact that these polls report a lower number of undecided voters. Who wants to admit that they don’t have a view? There is evidence to support this. One study in North America, for example, found that telephone respondents are often more suspicious about interviews and, crucially, more likely to present themselves in socially desirable ways. Another experiment that compared telephone and Internet methods found that phone surveys generated more random error and higher rates of social desirability bias. If this is true then it might be that Remain’s strong lead in telephone polls might not be as strong as we are led to believe, or it might not exist at all – although I find that one harder to believe. To illustrate these differences take a look at the table below where I compare results from the most recent telephone poll (Ipsos-MORI) with a recent online poll (Survation). You can see immediately how support for Remain is much higher across the board in the telephone poll whereas in the online poll by Survation there are larger numbers of undecided voters. I’ve also included results from the face-to-face British Election Study, conducted last year. In face-to-face Remain is comfortably ahead but across all three methods you can see how notable the differences are. This is why jumping on single snapshot polls is a game for fools. Another very real possibility is that the polls are still not adequately representing the views of key groups in society, which could make all the difference at the EU referendum. It has already been noted how, at the 2015 general election, the samples of people in the polls were not as representative as they should have been, over-representing younger Labour voters and under-representing Conservative voters. If this problem has not been properly fixed then it could carry real implications for the referendum. Those Labour-leaning voters tend to be more positive about the EU, which might be artificially inflating support for Remain. Another specific question is whether the polls are also accurately reflecting the average over-55 year old and young person. These two groups are at the opposite ends of the debate – the over-55s are the most likely to back Leave while the 18-34 year olds are the most likely to back Remain. But older Britons are very difficult to reach and it might be that current polls are skewed toward more politically engaged older voters. As one pollster, Adam Drummond, recently reflected: “It is possible that the same thing as happened in the general election with young people is happening again with online polls over-representing the easiest over-65s to reach on panels who happen to be more pro-Brexit than the rest of their age group”. If this is the case, with online samples over-representing more Brexit-minded older Britons, then alongside the evidence in telephone polls it could suggest that Remain has an edge. On June 23rd the less engaged older voters who are perhaps less Eurosceptic will turn out and have their views heard. Alternatively, if the samples of older voters are accurate but more ‘normal’ younger respondents are not adequately captured then the race could be much closer than we currently think. The solution? Well, one pollster thinks that ‘the true answer’ may lie somewhere between what the telephone and online polls are reporting. This school of thought has been influenced by the experience of Ukip, whose vote share at the 2015 general election basically fell between what the online and telephone polls were projecting. But I don’t find that explanation satisfactory – especially given the importance of the national debate and the fact that Euroscepticism is a more multi-dimensional phenomenon than support for a hard Eurosceptic party. What is clear -and is the central message of this briefing- is that until the problem is resolved we need to inject a new sense of caution into how we report the polls. Oh, and one last thing, as I went to bed last night rumours were circulating that Boris Johnson was about to come out for Leave. How important could Boris be? Take a look at the chart below, taken from a very recent Ipsos-MORI poll, and compare the reach of Boris to the only other Outers…. On February 24th Professor John Curtice and Matthew Goodwin will be discussing public attitudes toward the referendum at Portcullis House, House of Commons. Register here. On February 26th Chatham House will also be hosting a breakfast briefing for journalists on the referendum, featuring Anthony Wells and Professor Sara Hobolt. Journalists can register here. Damian Chalmers asks – Ever Closer Union – Does it matter? Chatham House briefing paper – What drives Euroscepticism? This entry was posted in British Expat franchise not rigging EU Ref., Harry Shindler letter to PM, Voting Rights, Worried about EU Referendum?. Bookmark the permalink. If this matter is of interest to you please sign it.